Fake but uncannily accurate: pulling out all stops, one great fraud confers the highest praise imaginable on another great fraud. “DR.” Maya Angelou, the tirelessly auto-flacked invention of one Marguerite Johnson, was the omnipresent big-hearted, wise, warm, corpulent Black Lady who has the 11 o’clock number in every politically correct show or film. She was also a savvy hustler who parlayed a totally manufactured, fine-tuned image of big-hearted, wise, warm Black corpulence (and badder than terrible world-class Bad Poetry) into major celebrity and quite a wicked pile of money (despite being an unapologetic fan of money-shy communists like Fidel Castro and Angela Davis). Best friend and mentor to Oprah, the Dem Party’s talentless Poetess Laureate did astoundingly well in a country that was, according to her and the Racial/Gender/Class Resentment Industry in which she thrived, SO mean to its big-hearted, wise, warm, corpulent Black “artists.” There was no question or problem or area of expertise (especially money!) that eluded or fazed “Dr.” Angelou. 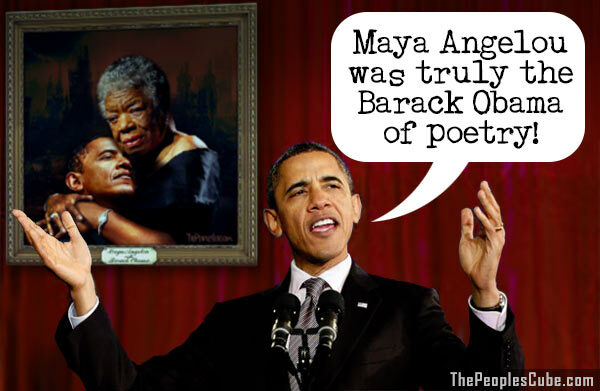 Slavishly idolized by the undiscerning Left, no one was more in awe of Maya’s astounding Greatness than Maya herself. Since when was Fidel Castro money-shy? Take a close look at his pictures. That commando uniform is tailor-made. And look at the shoes. Hand-made boots, polished black leather, really sharp. They’d make Elvis proud. Always check the shoes. It’s well known that Fidel lived like a Sultan and that Angela Davis gets something like $20K a pop on the lecture circuit. In the Communist Big Time, it’s understood that commissars are more equal than the proletariat.